One snowy day when our “repawters” Tanner and Rory were playing outside, they slid across the ice and secretly dreamed of wearing skates and gliding across the ice at Enterprise Center. They donned their best St. Louis Blues gear (because of course they are paw-some fans) and barked at their owners to take them to a game. What they soon found out was there is only one canine lucky enough to hold that exclusive access pass; and his name is Barclay. The labrador retriever puppy is the newest addition to the team roster. Born back in September, Barclay is being raised and trained by the St. Louis Blues to become a service dog. “As puppy raisers, the goal is to provide as much stimulation and socialization as possible to really get the puppy ready for any type of situation that their handler might bring them to,” says Randy Girsch, the Vice President of Community Development and Event Management for the St. Louis Blues. It’s a partnership with Duo, an organization that “exists to create extraordinary bonds between people and dogs,” says Executive Director Peggy Musen. “For more than thirty years, we have been tapping into this powerful connection to make a difference in individual lives, families and the community. We do this through our specially-trained assistance dogs who help an individual client gain independence or our facility dogs that do important community work that impacts people of all ages, all over the world.” The cost of training just one dog is approximately $27,000. That dog is then placed in a facility or with an individual at no charge. Barclay lives with Girsch, and he spends all of his days “at the office,” meaning he spends time around his desk friends in addition to his “teammates” on the ice. 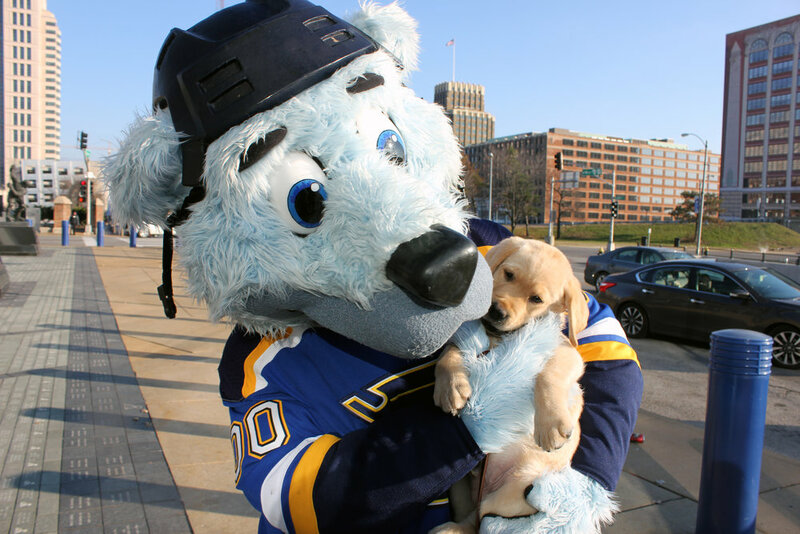 While he loves all of the Blues players, he became “fast friends” with Louie, the team mascot. The two do a lot of socializing around and outside of Enterprise Center. Fun fact: Louie makes more than 300 appearances each year, not including games. So for about the next year or so, Barclay will continue enjoying his VIP views of the games, his Purina Pro Plan Savor Training Treats and eventually some travel time with the team. And for wannabe team dogs like Tanner and Rory, at least the True Blues Authentics Team Store now has more furry friendly merchandise available for purchase!